Since its debut production, Lives In Art in 2011, Sheffield People’s Theatre has made many memorable shows with the Crucible, culminating in a spectacular retelling of the Camelot legend co-produced with Slung Low. This year’s tale, A Dream, may not be as ambitious as that, but it’s no less entertaining. Local writer Chris Bush has created a Shakespearean ‘mash-up’ in the style of the BBC’s Dickensian. It’s basically A Midsummer Night’s Dream retold in a hospital, but with other Shakespeare characters regularly dropping in. So, we see Beatrice and Benedick 30 years after Much Ado, the latter now in need of a knee replacement. Romeo and Juliet are reimagined as a young gay couple recovering from an overdose and an elderly Antony and Cleopatra also show up. Bush’s heartfelt and witty play is an absolute delight, and although there’s a sense that rather too much is being crammed in at times (there’s a few too many musical numbers, for instance), director Emily Hutchinson nails the pacing. Considering this is a community theatre show with a cast of 100, the standard of acting is incredibly high. There’s certainly not a weak performance among them. 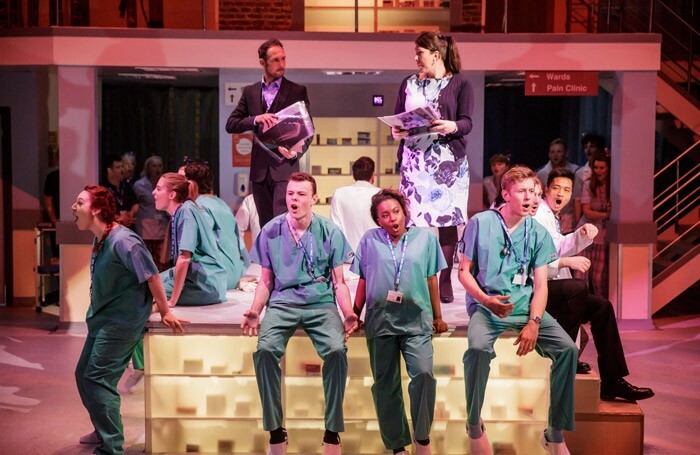 Kevin Jenkins’ uncannily realistic hospital set and Russell Hepplewhite’s lively score add to the fun. Yet, as the man from Stratford-upon-Avon said, the play’s the thing, and it’s Bush’s love letter to Sheffield, Shakespeare, the NHS and theatre itself, that really makes this.